Raise More Money With A Golf Ball Drop! Pago-Pago, American Samoa – Looking to raise more money at your golf event this season? 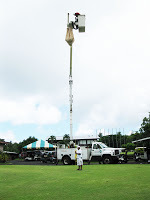 Maybe it’s time to add a golf ball drop to your event! The people of American Samoa are another step closer to the dream of having their first community swimming pool thanks to the Rotary Club’s 6th Annual Golf Tournament & $50,000 Golf Ball Drop. Contestants in the golf ball drop purchase one of 1000 numbered golf balls which are then dropped from a bucket truck onto a target “hole”. If any of the five numbered balls falling closest to the hole match a preselected lucky golf ball number, the “owner” wins $50,000, paid for by Hole In One International’s sister company, Odds On Promotions. While there wasn’t a $50,000 grand prize winner, three lucky ball-buyers still received some fantastic prizes. The first-place winner, Spencer Sword, took home a round-trip ticket to Honolulu, courtesy of Hawaiian Airlines. The second-place winner, Jackie Young, picked up $500 and the third-place winner was Jeff Shively who won $250. This year’s event helped the Rotarians to surpass their $100,000 fundraising goal getting them that much closer to a community pool. Minnesota Man Makes Prize Winning PuttHole In One International Insures a Shot at Glory! Home » Blog » Raise More Money With A Golf Ball Drop!